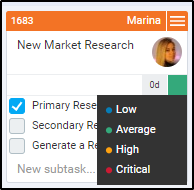 How to work with the subtasks in the cards? How to convert a subtask to a regular card? What is a Kanban Card? How to create a Kanban Card? How to move a card? What is the card Context menu? How to assign a card? How to attach a file to a card? The place of the card in the column shows its priority and implements a queue. The system order of the cards in the column is by date. The ones on the top of the column are created first (older cards), while the newly added cards come at the bottom. The users are supposed to tackle the tasks that were created first to last - this is related to the cycle time of the card and respectively to the lean principles of delivering the tasks as fast as possible. Users can manually change the order of the cards in the column. You can label the cards with flags in different colors to show their priority (low, average, high, critical). To see the priority color on the cards themselves, you need to configure the Card View settings. Go to the Grid menu at the upper right side of your board interface -> select Configure Card View -> Card Settings -> tick off “Show priority”. Another way to categorize your tasks is to use the color code of the cards. Use warm colors for high and critical priority and cold colors for normal and low priority. Learn more about prioritizing tasks with Kanban. How to use card tags?